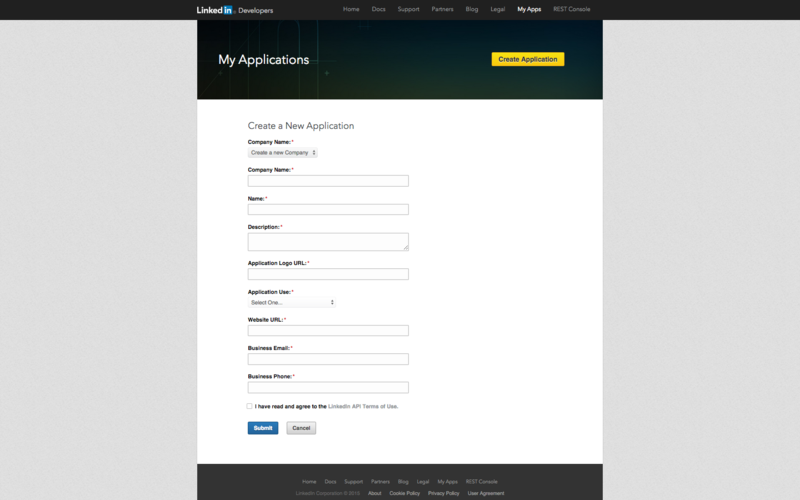 Here’s the step by step instructions on how to create a LinkedIn API application to be used with the WP-LinkedIn plugin. I will try to keep it as accurate as possible but if you notice any discrepancy or have questions then don’t hesitate to post a comment. 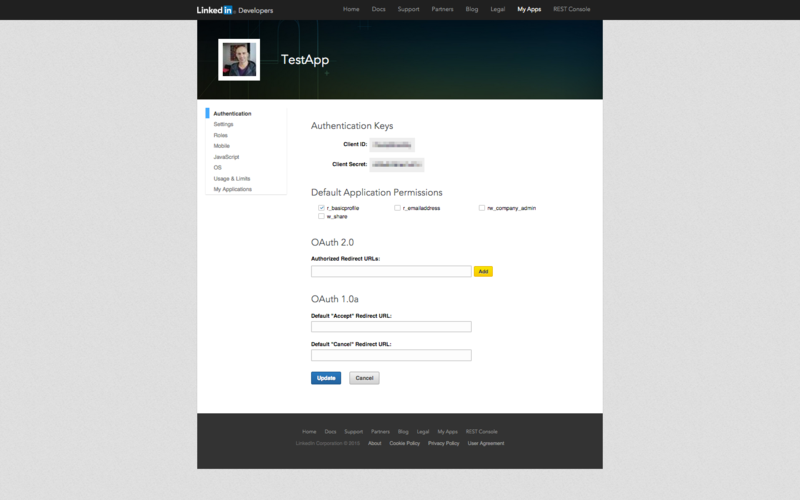 On the next form you will have to add the OAuth 2.0 authorized redirect url which is given to you on the settings page of the plugin (something like http://yourdomain.com/oauth/linkedin/). You must give the exact url, including the trailing slash if there is one. Paste it in the field then click on the yellow “Add” button. Click the “Update” button. Finally copy the authentication keys (“Client ID” and “Client Secret”) and copy them in the corresponding fields on the plugin’s settings page and click on the “Save Changes” button. Once the settings have been saved you will notice an error message that says that your authentication token is expired or invalid (you don’t have one yet, so it’s definitely invalid). Click the link in the message and you will be taken to LinkedIn. They will ask you to login (unless you’re already logged in) and then will ask you to authorize the application to have access to your profile. 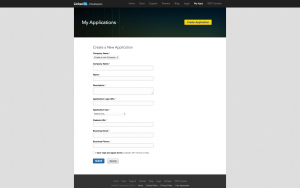 Once you authorize the application you will be redirected to your website. 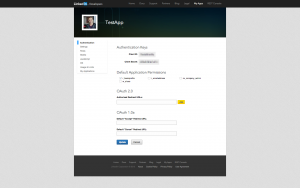 The requested URL /oauth/linkedin/ was not found on this server. I can’t speak Italian but I guess you have a problem with the redirect url. Can you tell me more about “permalink settings”? An error has occured while updating the access token, please try again. I got the exact same error . I followed your instruction but it still did not work and the error persists. I get an object not found message in the last stage… probably because I have an SSL? you have that message on an URL from your website? Yes. It is a 404 message. Make sure you correctly entered the Redirect URI that is given to you on the options page of the plugin. I tried to go to permalink page and save, but it made no change. I tried to create the folders in the /var/www/html/ but it didn’t work too. Hi Edwin, what’s your website’s url? I hope you can answer my question. 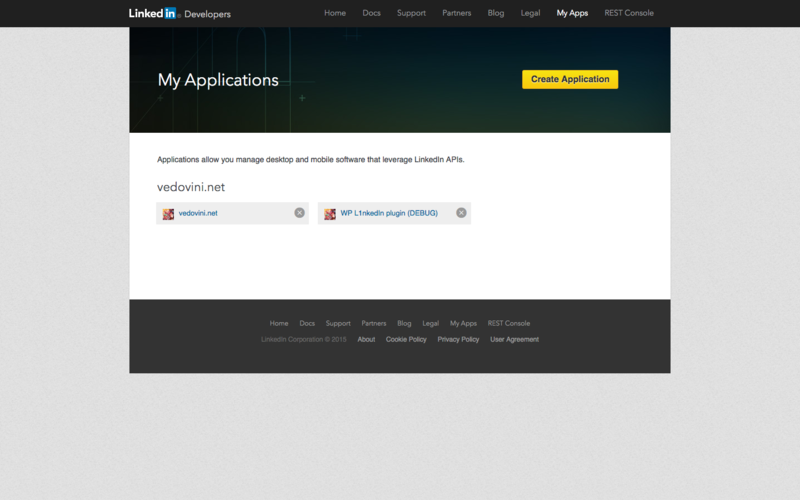 For a school project i need some sort of linkedin integration within a CMS system (wordpress in this case). I installed your plugin and created a linkedin key and secret key. Than i used the redirect URL (given by your plugin) and added it in the redirect field at linkedin/developers and it was accepted. until here everything is working. The last step is to get a token, but when i click on the link (given by the alert in wordpress) to activate a new one; it sends me to 404 page. I didnt create the folders/files where the token-link sends me to. You didn’t do anything wrong, try to go to the permalinks settings page and save it. Then try again to get a token. First of all, thanks for you quick reaction. with a URL next to it. I saved the permalinks page and tried to get a token. Now the linkedin login screen shows up, as i fill in my credentials and press login its still sends me to a 404 error page. Never mind, I played with the permalink options a little bit and changed the permalink to the first availible option (plain). Hi, I successfully completed all the steps. I want to show my linkenin recommendations by this shortcode [li_recommendations width=”480″ length=”200″ interval=”1000″] I used it into my page but it didn’t work. But when I used [li_profile] to show my profile, it’s working. But I don’t want to show my profile. I want to show my recommendations as rotating scrolled. Please give me suggestion. Or did i do anything wrong? So how can I be granted full access to my profile by linkedin? And when I use the link at the top of the WordPress admin pages, to Authorise access. the Above the Authorisation window, it says “Client is disabled” . So, authorising with my username and password doesn’t change anything. Thought I’d already done that a few times. All good now. I see the “recommendations” data isn’t displaying for me. Also, is there a way to display a bit more of a LInkedIn look and feel to the Widget display? Hello Claude!, Ive just installed the plugin, got the client id and client secret, redirect url is the same as on the linkedin plugin redirect url, when it says “Your LinkedIn access token is invalid or has expired, please click here to get a new one.” i do that then i get the error message “Error message: Your application has not been authorized for the scope \\\”r_fullprofile\\\” (invalid_scope)” How do i go further from here??? Any help? I am getting 404 error while activating the access token. 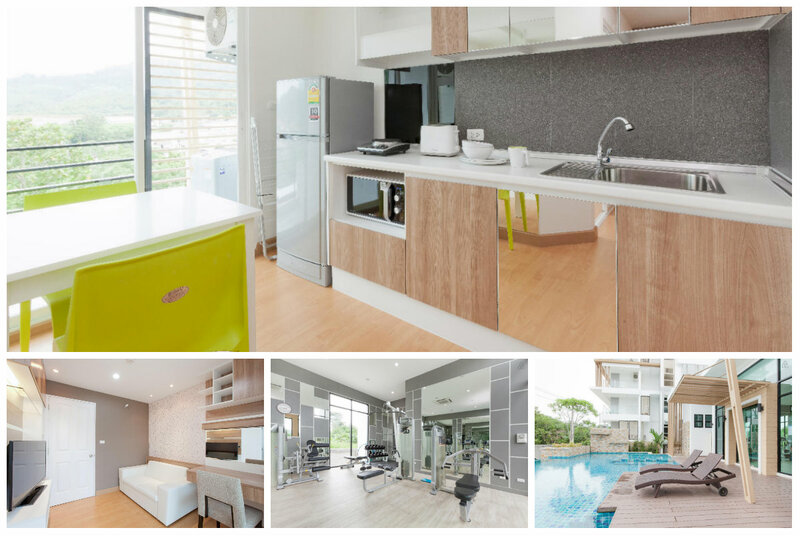 I have created virtual host in wamp. Also also tried to go to the permalinks settings page and save it. Our logo isn’t a square, its a rectangle. What do we do? You have only access to the recommendations if you are a LinkedIn partner and they granted you access to the full profile. Once that the case you’ll need to check the “Full Profile” box in the option and request a new token. I see. I did, yesterday, send a request/application for that, but I see you have doubts they will do that? I will cross my fingers and wait and see if they approve me for that. Thanks for your quick answer, Claude. Hi Claude! 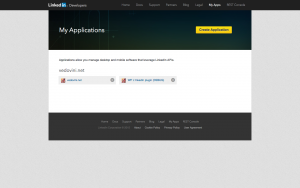 I have the problem with wp-linkedin plugin. I have added this plugin, activated it, set api and secret keys. Created new page where placed shortcodes and new page with url as redirect url. But I cant see some changes( it doesnt works for me. the plugin keeps a cache of the LinkedIn data, if you change your LinkedIn profile and wants it to be immediately updated on your site you need to empty the cache using the button on the “Tools” page of the plugin’s option page. For a client I am trying to have linked in on a page. I have the problem with the redirect_uri (does not match the registered value). I have read a lot of posts about this, here and in wp-org. I tried the perma settings. I tried the slash, with, without. I tried the ?oath=linkedin and just the website name. I tried the tip with the cache, empty cache. I tried a lot… But I still get the error message. Am I correct that “Site Address” and “WordPress Address” in most cases will be the same? In my case I have them both set to ratelnet.me. I don’t see a field where I can enter a redirect_uri in the General Settings. are you sure the API client Id and key have been properly saved on the options page? 414 means the uri is too long, which server is giving you this error? LinkedIn’s or yours? That’s strange, either the limit on your server is lower than usual or the url to your dashboard is particularly long. Can you go to https://vedovini.net/contact/ and send me the url you are sent back to please? Hello I am trying to install for my client but same issue about ” Your LinkedIn access token is invalid or has expired, please click here to get a new one.” after clicking on save again it is same issue also as mentioned in about comments / threads i went to permalinks and saved permalinks and again i came back on the settings page of linkedin in wordpress still issue is same. and followed the instruction while creating the APP too. you mentioned you clicked on “save” but did you follow the link to get a token from LinkedIn? So far so good. Thanks! Dear Claude, thank you for your answer. I can confirm you that we are using your plugin. Could you precise me which are the LK’s fields that we can map and could we add some? I have problems with Company ID´s. I ID is not displayed in the plugin settings. Do you know what’s wrong?